Floor plans include a comprehensive site survey and creation of AutoCAD files for each floor of the building (including any floors below grade), bearing the signature and seal of a registered design professional, marked to reflect exit routes, in-building relocation areas, and other information contained in plan documents amenable to graphic representation. A floor plan table of contents, including drawing number and title. 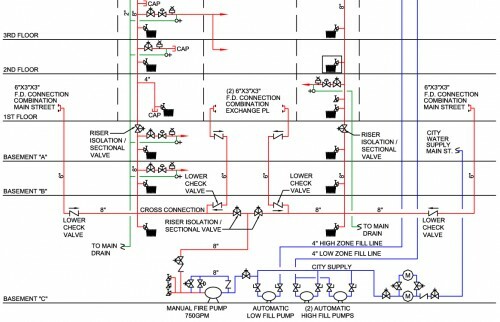 Standpipe and Sprinkler Riser Diagrams include a comprehensive site survey and creation for each individual suppression system located in the building.